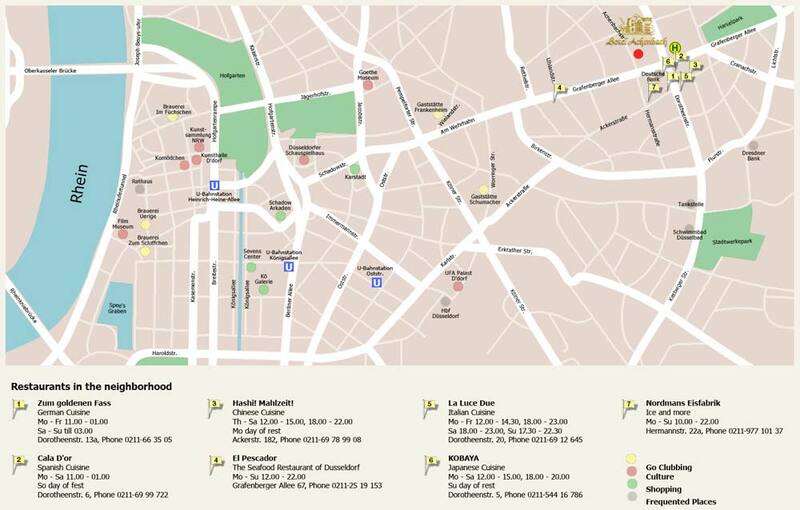 Our hotel is located at the heart of Düsseldorf, in an extremely peaceful side road. You will find very good restaurants, supermarkets, pharmacies, cafés and much, much more in our immediate vicinity. Public transport connections are also just a short distance away. It is just a 3-minute walk to the stops from which a bus departs for Düsseldorf’s Main Rail Station and from which 3 trams will take you to the Old Town within 10 minutes. Travel just 2 stops or walk for 10 minutes to a rail station from which the train will take you directly to Düsseldorf Airport. Bodystreet Düsseldorf, Brehmstr. 3 in 40237 Düsseldorf. Travel approx. 8 minutes on the tram or walk for 12 minutes from our hotel. Bodystreet is the perfect gym for you if you like to save time; with an efficient EMS training programme for 20 minutes per week, it is ideal for losing weight or for training the bum and tum muscles. Fit & Beauty, Rethelstr. 98 in 40237 Düsseldorf. Travel approx. 10 minutes on the tram or walk for 11 minutes from our hotel. Take the easy route – comfortable, strong and healthy – with more fitness, more well-being and more beauty. Düsselstrand swimming baths: swimming & bathing, beach sauna, various activities including aqua gymnastics, H²O – Tum, Legs & Bum, Aqua Power, Aqua Mix and pregnancy exercises. You will find the Düsselstrand swimming baths at Kettwiger Str. 50 in 40233 Düsseldorf. Travel approx. 7 minutes on the tram or walk for 13 minutes from the hotel. Münster Therme thermal baths: swimming & bathing with a saltwater outdoor pool, sauna & massages, and a salt cave. You can find the thermal baths at Münsterstr. 13 in 40477 Düsseldorf. Travel approx. 20 minutes on the tram or approx. 8 minutes by car. Oliver Schmidt Hair Design, Uhlandstr. 25 in 40237 Düsseldorf. 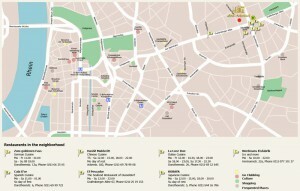 It is just a seven-minute walk from our hotel to one of Düsseldorf’s best hairdressers. Capitol Theater, Erkrather Str. 30 in 40233 Düsseldorf. Travel approx. 17 minutes on the tram, walk for approx. 20 minutes or go by car or taxi and you will reach the theatre within 6 minutes. Messe Düsseldorf (Exhibition Centre), Stockumer Kirchstr. 61 in 40474 Düsseldorf. If you take public transport, you can be there within three-quarters of an hour or travel by taxi/car and you will reach the Exhibition Centre within 17 minutes. ISS Dome, Theodorstr. 281 in 40472 Düsseldorf. Travel to the ISS Dome in approx. 37 minutes with public transport or go by taxi/car and you will reach your destination in approx. 12 minutes. Düsseldorf Congress Sport & Event GmbH ESPRIT Arena, Arena Str. 1 in 40474 Düsseldorf. Take public transport and you will be there within approx. 40 minutes or travel to the Arena by car/taxi in just 18 minutes. Deutsche Oper am Rhein (German Opera on the Rhine), Heinrich-Heine-Allee 16a in 40213 Düsseldorf. Travel for 10 minutes with public transport or by taxi/car. Roncallis´s Apollo Varieté Theater, Apollo-Platz 1 in 40213 Düsseldorf. Travel approx. 12 minutes by car/taxi or take public transport which will get you to the theatre in approx. 20 minutes. Mitsubishi Electric Halle, Siegburger Str. 15 in 40591 Düsseldorf. It takes 10 minutes by car/taxi and approx. 20 minutes with public transport to get from our hotel to the indoor arena. Just a five-minute walk away, you will find one of the best restaurants in Düsseldorf. Experience a unique piece of Italy with the best wine and service with a 10% discount voucher from us. This voucher is only available to guests of the hotel; you can get a ticket from us at reception. It is just a three-minute walk to one of the best Spanish restaurants in Düsseldorf. Tuck into Spanish specialities right at the heart of Düsseldorf. Just 3 minutes away on foot, you can spend the evening tucking into extraordinary Greek specialities. Walk for approx. 10 minutes or travel 2 stops on the tram to a German classic. Frankenheim (named after the brand of Düsseldorf dark beer) is a typical German restaurant, where you will find more locals than tourists. A beer garden and restaurant are located downstairs; a brewery is located upstairs. Just a seven-minute walk away, you can enjoy freshly prepared fish and have the feeling of being at the seaside. Zum goldenen Fass is a typical German pub with Sky TV. Just 5 minutes away, opposite the Italian restaurant La Luce Due. Drink a couple of cold beers with your friends in the evening and cheer on your favourite football team to victory or play a round of pool. Enjoy a delicious ice cream, sorbet or fruit ice lolly on hot days in one of Düsseldorf’s best ice cream parlours. It is just a four-minute walk away from our hotel.